Unlike in Vanilla, dirt is affected by gravity. This means that any dirt without a block underneath it will fall, like sand, gravel and cobblestone. Unlike gravel, dirt cannot be used to create walls; it will fall over into piles until it is supported on at least three sides. Grass is not affected by gravity. However, grass with air underneath it has a chance of turning into dirt and collapsing when being walked over by mobs or players. Dirt varies in color to match the rock layer directly below it. With grass covered areas, it may be hard to notice a transition between dirt colors, but the transition is much more obvious in areas with dry grass or cliffs with exposed dirt. The color of dirt has no effect on the nutrient content once tilled into farmland. Farmland, also known as soil, contains three basic nutrients for crops. By using the water and nutrient modes on a metal hoe, the Player can get a visual indicator on the plots of the nutrient levels and the access to water. Nutrients are diminished by growing crops in the soil and are replenished over time by either letting the plots "fallow" for a season or by planting your crops in cycles, choosing a crop that has a different nutrient requirement than the ones that are depleted in the earth. Dirt blocks will have no nutrients when tilled, while grass blocks will have full nutrients. Sand is found along riverbeds and oceans and in deserts near the equator. Unlike in vanilla, sand cannot be used to create walls; it will fall over into piles until it is supported on at least three sides. Sand varies in color to match the rock layer directly below it. This can be useful to determine when the surface rock layer changes along the ocean floor. Sand can be used in Sluices, where it is more likely to return gems than ores. It will provide 20 soil when thrown into a sluice, or the block can be placed underneath a water source, in a river or ocean biome, and right clicked on with a Gold Pan. Glass is made by smelting sand in either a fire-pit or a forge; melting at Dark Red. Gravel is found along riverbeds and oceans. It's primary use is in Sluices, where it is more likely to return ores than gems. It will provide 20 soil when thrown into a sluice, or the block can be placed underneath a water source, in a river or ocean biome, and right clicked on with a Gold Pan. Gravel may also drop flint when mined with a shovel, which is used to make Flint & Steel and Arrows. 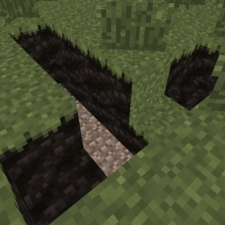 Peat spawns in dirt below or equal to a y-level of 146. It can be used as fuel in a fire-pit. Like dirt and clay, grass can grow on top of peat, therefore hiding the texture and making it harder to find. Peat deposit hidden under grass. This page was last modified on 8 November 2014, at 06:08.